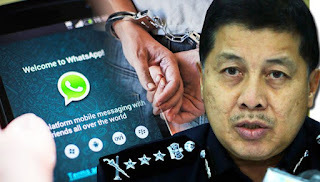 Malaysians are outraged when Johore police yesterday arrested a 76-year old senior citizen was arrested in Kampung Tunku yesterday for an offence under section 233 of the Multimedia and Communication Act 1998. The senior citizen was arrested for allegedly sent an offensive image of Prime Minister Najib Abdul Razak under the name “Pa Ya” in the WhatApp group “Bicara Politik Melayu”. It seems to us that the oppressive nature of Najib’s regime has shown its true colour since the break out of his RM4.2billion scandal. Cabinet ministers, UMNO leaders and government officers including top law-enforcers who work against him are sacked and removed from their positions. Political dissents, social activists, artists and even ordinary Malaysians, in this case a 76-year old, are subject to intimidations, persecutions and selective prosecutions. It is sad and no doubt that freedom of expression in Malaysia has gone downwards.